A vocational class at a child development centre in Indonesia has given Compassion assisted children the opportunity to learn farming skills by planting chilli in a field. Like the best chilli, the idea was too hot to contain, and it has spread beyond the class and into the community. Why not start a farming class? It was a simple idea that came to Adrianto Wukelan, a tutor at a local Compassion child development centre in Paso Village, Minahasan, Indonesia. With children spending six to seven hours each day in a classroom before coming to the centre, it was difficult to capture the attention of the children with interesting content. 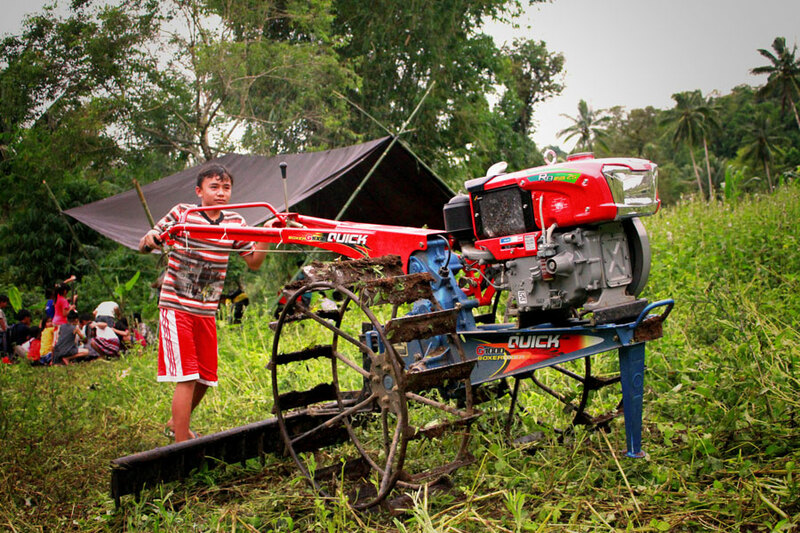 A farming class would equip the children with farming skills, Adrianto thought, and they had plenty of prime space: a member of the local church congregation had lent the centre 37 acres of his land to use for farming. “After almost a whole day of attending classes in their school, we wanted to give [the children] another learning experience,” says Adrianto. The only decision left to make was what to farm and the resounding winner was chilli. The high demand for chilli among local people makes it a lucrative market. In the typically cold climate in Minahasan, spicy food is a staple part of the diet with chilli-laced foods used by locals to keep warm. Through the farming classes, the aim is to increase the children’s interest in potentially someday becoming a farmer and to change their mindset about the profession. Three times a week, Adrianto and 10 teenage students walk the short distance from the centre to the field. While there, they learn how to prepare the soil and chilli seedlings, and all about fertilisation, planting and harvesting. Since the farm started in January 2014, they have planted 835 chilli trees in eight plots that are 30 metres long, and they have harvested 10 times, with each chilli tree able to produce 10 kilograms. The influence of the chilli farm is wide–reaching, with people in the community turning to planting chilli on their land and asking Adrianto for advice. Once a week, children from other classes have the opportunity to go to the chilli farm. The younger children usually assist by preparing a place for seedlings by putting soil in a plastic bag. At harvest time, they don’t just harvest chillies, they harvest smiles! It has quickly become a favourite time for all the children. Numerous children who have been learning about farming have been taking what they have learnt and are planting chilli in their homes. 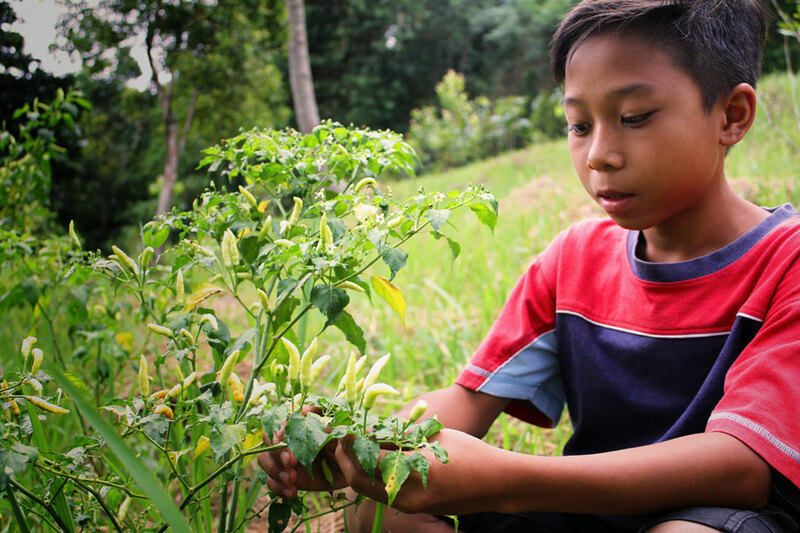 15-year-old Reivivo Kaeng now has more than 15 chilli trees at his home. Learning about farming has enabled Reivivo to think about alternatives for his future—he has thought about studying agriculture to complete his farming skills. 13-year-old Memi Salomo Unibar is a local boy who had the opportunity to visit the chilli farm and is eager to put into practice what he saw. The chilli farm has exceeded the expectations of the tutors and children, adding a little spice to their time at the centre.